Welcome to the beautiful Tippecanoe River! We’re so happy that you enjoy swimming, fishing, boating, and playing in this area. But before you do, there is some important information you need to know. So here is a list of the five most important things you can do to help save the mussels while still fully enjoying the Tippecanoe River! 1. DON’T PICK ME UP! – Do not collect mussels! Leave mussels in the water and tell your friends to do the same! Mussels belong in the water. By leaving them where they belong, no unnecessary harm will come to the animal. So, even if a mussel looks dead, leave it where you found it, you can never be too sure! Mussels have specifically adapted to blend in to look like rocks so they can fool predators. Mussels just want to be left alone. 2. DON’T LITTER – Pick up your trash! Mussels work very hard to keep the Tippecanoe River clean. You can help them by making sure all of your trash goes into proper bins and not into the river. When you visit a park along the river, find the trashcans. When you canoe, kayak, or float down the river, make sure you bring a bag with you to keep your trash in and dispose of your bag when you get off the river. Mussels may look tough with their thick shells, but they can be crushed if you drag heavy objects over them. When you’re out on the river and you come across a low water spot, make sure you, your family, and friends get out of boat and carry it to deeper water. The mussels will be very happy that you were so considerate! 4. Meet our Mighty Mussels! Visit the Tippecanoe River State Park and learn more about our very own Hearts of the Tippecanoe River by participating in searching the Mighty Mussel Mania to win a prize! 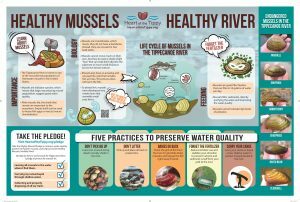 Also, find the Healthy Mussels, Healthy River interpretive signs placed at a number of locations to learn more about how you can protect freshwater mussels and improve water quality. 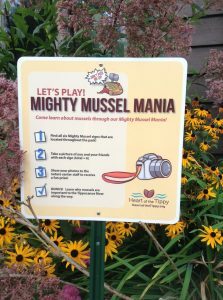 Find the Mighty Mussel Mania instructions at the Tippecanoe River State Park Nature Center and play the game to win a prize! Find these signs at Tippecanoe River State Park, Winamac Town Park, Potawatomie Wildlife Park, Leiter’s Ford DNR boat launch, Oakdale Dam DNR boat launch and soon, Prophetstown State Park. Know anyone else planning on spending time on the Tippecanoe River? Great! We would love for them to help save the mussels too! 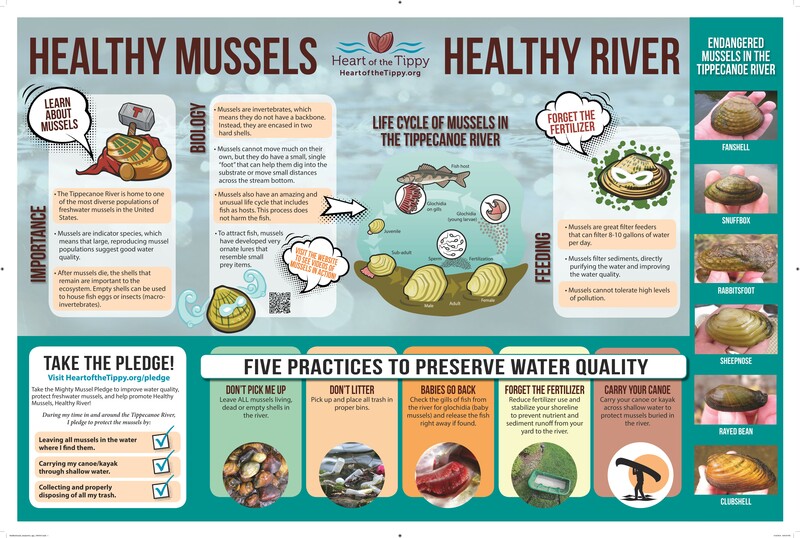 Share with them why mussels are important and what they can do to help save them. If they still have questions send them to our website, www.HeartoftheTippy.org!